Python is a language with many qualities, but few would claim that performance is among them. While libraries such as Numpy can be used, they are not as flexible as being able to write code directly in a high-performance language. Unfortunately, writing the performance-critical parts of a Python program in (say) C is not always a good experience, and the interfacing between the Python code and the C code can be awkward and inelegant (although to be fair, it is still nicer in Python than in many other languages). It would be more convenient if we could compile a high-performance language directly to a Python module that we could then import like any other piece of Python code. Of course, this entire exercise is only worthwhile if the code in the resulting Python module executes much faster than manually written Python. Fortunately, when most of the computation can be offloaded to the GPU via OpenCL, the Futhark compiler is capable of this feat. OpenCL works by having an ordinary program running on the CPU that transmits code and data to the GPU (or any other accelerator, but we’ll stick to GPUs). In the ideal case, the CPU-code is mostly glue that performs bookkeeping and making API calls - in other words, not resource-intensive, and exactly what Python is good at. No matter the language the CPU code is written in, the GPU code will be written in OpenCL C and translated at program initialisation to whatever machine code is needed by the concrete GPU. This is what is exploited by the PyOpenCL code generation backend in the Futhark compiler. Certainly, the CPU-level code is written in pure Python and quite slow, but all it does is use the PyOpenCL library to offload work to the GPU. The fact that this offloading takes place is hidden from the user of the generated code, who is provided a module with functions that accept and produce ordinary Numpy arrays. To demonstrate this capability, we will implement a simple Mandelbrot set visualisation program in Python. We will use Futhark to compute the set and produce the pixel data, and make use of Pythons png module to write an image file with the result. 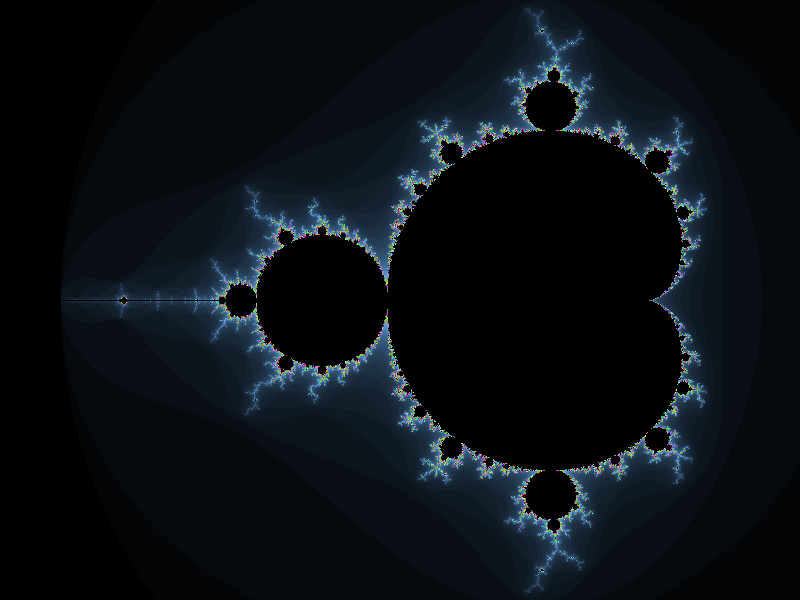 Our program will consist of two files: mandelbrot.fut and mandelbrot-run.py. This produces a file mandelbrot.py defining a single Python class mandelbrot, which we can access from ordinary Python code, as shown below. # The .get() is to obtain a Numpy array instead of a PyOpenCL array. A slightly more elaborate Python program, which supports command-line parameters and reports timing, can be found here. Every entry point in the Futhark program becomes a method in the generated class. An entry point is any function named text, as well as any function defined using the keyword entry instead of let. In most cases, the type of the Futhark function maps easily to the Python world. For example, a Futhark function accepting three parameters of types f64, i32 and bool will be translated into a Python method accepting a two-dimensional Numpy array of numpy.doubles, a one-dimensional array of numpy.i32s, and a single numpy.bool. And if the Futhark function returns (i32, f64), the Python method will return a tuple of two values: a Numpy array of integers and a Numpy double-precision float. Things are more complicated when the entry point accepts or returns types that do not correspond easily to Numpy types. Actually, the reason is that the generated code makes use of Futhark’s internal value representation, but I’m happy to blame Numpy instead. For example, a function that accepts an array of pairs (e.g. (i32,f32)) will be turned into a method that accepts two arrays: one of integers and one of floats. Similarly, all tuples are flattened. This not only means that a Futhark function returning (i32, (f32, f32)) will be turned into a Python method returning a tuple with three elements. It also means that a Futhark function taking an argument of type (f32,f32) will be turned into a Python method accepting two arguments, each being a float. The best workaround is to only use simple types in entry point functions: return only flat tuples, and accept neither tuples nor arrays of tuples. You can still use tuples and arrays of tuples in your function bodies and internal functions, it is only the entry points that are problematic. The zip and unzip operations are entirely free in Futhark, so ziping two passed-in arrays into a single array of pairs carries no overhead. We have an implementation of Game of Life that uses Pygame to render the ongoing simulation. It supports several variants of the game rules, some of which look rather interesting when visualised. It is also an example of a program that uses multiple entry points. We also have an interactive Mandelbrot explorer, the Futhark core of which is very similar to the one described above, but where we have written a Pygame interface that allows interactive scrolling, zooming, etc. We are quite interested in developing more interesting use cases for Python-Futhark interop. The best use cases are those that perform a good bit of work on the GPU, to amortise the relatively inefficient host-level Python (not to mention copying back and forth between system memory and the GPU). If you can think of something, or even want to try your hand at implementing it, please contribute!